SAVE when you buy the Norton Water Stone Kit versus purchasing these stones separately. Water stones have earned a loyal following because they sharpen very quickly and are available in extremely fine grits. This Water Stone Kit contains everything you will need for sharpening your tools and knives with water stones. The kit includes a 220/1000 Combination Water Stone, a 4000/8000 Combination Water Stone, and a Flattening Stone, all by Norton. At 8" long and 3" wide, the Norton Combination Water Stones are large enough for just about any type of sharpening. And with four stone grits, you'll be ready for any sharpening job. The 220 grit is a very coarse stone that sharpens very quickly. The 1000 grit is a real workhorse in the shop because is takes a rough edge and refines it to a useable edge. The 4000 grit will create a very fine edge, and the 8000 grit side will polish the edge and ensure that you’ve sharpened your tool or knife to perfection. 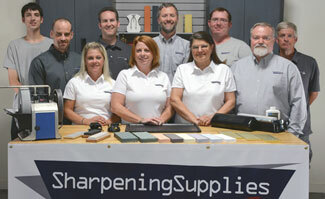 When used in conjunction, these stones make sharpening quick and easy. The one thing that every water stone user needs is a way to flatten the stones when they become dished. The softness of water stones makes them cut very fast, but also causes the stone to dish. 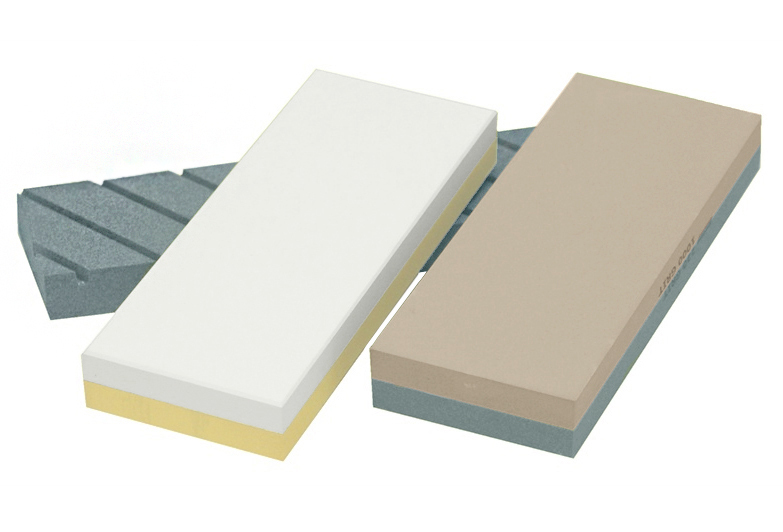 The Norton Flattening Stone is a fast and effective way of maintaining a flat surface on your water stone. Instructions on using the flattening stone are included. Q. Do these Water Stones require a stone holder? A. While some people prefer a stone holder, one is not required. The plastic cases of these Water Stones have 5 rubber feet along with a place for the stone on top and can hold the stone while sharpening. The bottom of the plastic case will act as a water reservoir. Q. Do you store the stones wet? A. Some people like to store the Water Stones in a bucket of water, however this isn't needed. Soaking the stones in water prior to use is all that is required. If you are storing the stones in the plastic cases, we do recommend that you let the stones dry prior to long term storage. Q. I've heard that Water Stones wear faster, does that mean the stones will wear our quickly. A. Water Stones do wear faster than harder oil stones. However, faster wear does not mean the stones will wear out quickly. For most people the stones will last years if not decades of use.